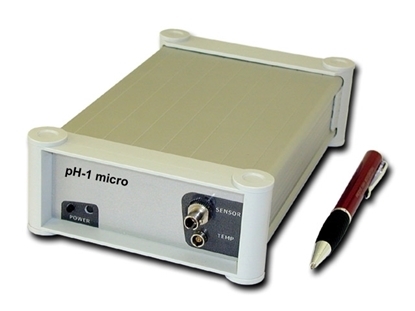 The pH-1 Micro instrument is a precise single channel, temperature compensated pH meter, for use with fiber optic pH micro sensors. It requires a PC for operation and is controlled via included software for Windows, which also saves and visualizes the measured values. 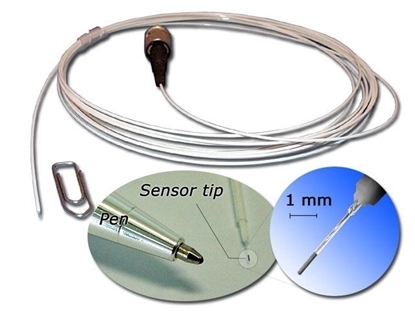 This fiber optic micro pH sensor is housed inside a 70 mm long syringe needle compatible with the sample holder for our BOBS™ instrument to allow real-time measurements of pH in micro liter samples. The pH sensitive tip of the optical fiber is protected inside a stainless steel needle, but for measurement purposes the tip can be exposed by pressing a plunger. This design allows for easy penetration through skin, a rubber septum or any other harsh material as well as for secure transportation and insertion.